Have been feeling a little bit uninspired lately. The cold and the lack of creative stimulation has left me feeling a little dull. On Tuesday, I decided impulsively, Lets take a crazy possibly unworkable idea and do a test shoot! And let's hit while the metal is hot. Do it this week! With the help of some very wonderful people I've befriended in Chicago we managed to materialise this crazy little idea. I wanted to do a shoot that involves fire. Had a little Brain storming session with Justin (Photographer). We went from setting mannequins on fire to thinking of ways to set the model on fire.... after some thought we decided we should not try to kill anyone during the shoot. And decided to turn the model into a candle instead. We would melt tonnes of candle on the model and kinda do a candle mould on her. Sounds simple enough. The only model I had in mind was Kathryn, she has this ethereal beauty about her that would fit this whole theme perfectly. Sent her a msg and she was in on the shoot within 5 mins. I was happy. I mean how often do you actually get everything going right within 30mins of coming up with an idea. I was filled with excitement. We made plans to meet up at Justin's place to "drip hot wax" on Kathryn. It was an unnerving experience. "Will I hurt her? Will the wax form into the perfect shape I have imagined? Can we remove it without breaking it? I wanna do a shoulder piece and head piece....How can I do it?" I must agree we were a little over optimistic. I imagined the candle would burn faster and that with vaseline & powder as a barrier, the pain would be nothing. I was wrong. 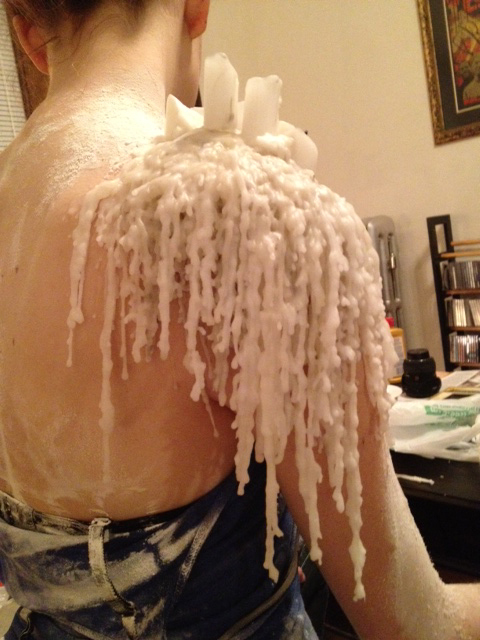 So poor Kathryn tolerated almost 5 hours of torture as we stood there and slowly dripped bout 4 boxes of candles on her shoulder.